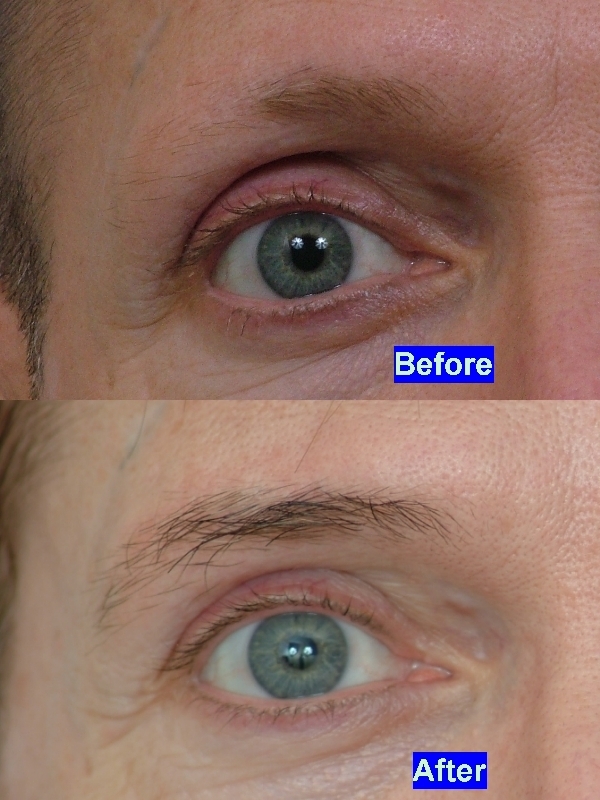 Nuisance eyebrow hair successfully removed via CIT -THE RESULTS! Eyebrow hair is typically coarser than scalp hair. For this reason, we used eyebrow hair to improve the coverage of the eyebrow. The patient has returned after 10 months to show us the remarkable healing since the procedure. Below are pre-op, post-op, and follow-up photos of the successfully treated patient. Good luck to the patient. 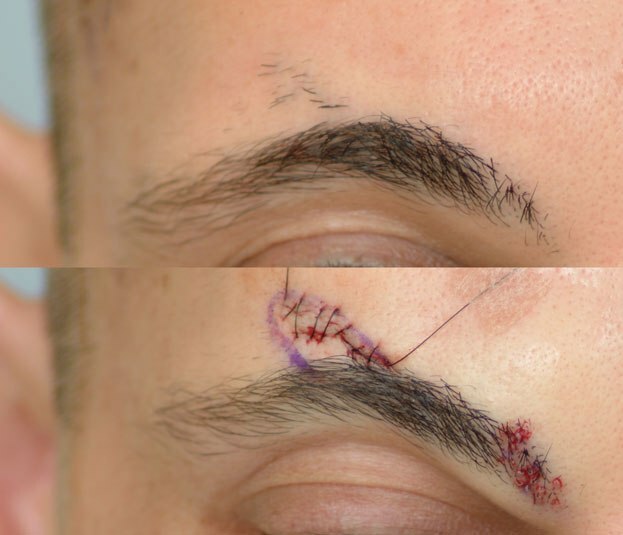 How come you wouldn’t suture the fue scalp donor site but you did that for the misplaced eyebrow hairs? Isn’t it the same CIT technique that is used to extract the follicles? » to extract the follicles? The suturing is not a guaranteed method of producing scar less healing but a measure of producing exceptional healing. Some follicular units contain thick coarse hair; we suture the sites of extraction to make the extraction sites smaller thus producing a better healing result. Devices used in this procedure are actually not typical instruments used in normal CIT extraction because of the possibility that changes in the skin pigment changes may occur along with unneccesary bleeding. The patient’s unwanted hair had similar characteristics to plugs. They were large and coarse but this suturing method is basically performed at Dr. Cole’s discretion. We have observed that scaring is less evident when sutures are used on certain donor areas of the body. Some areas of the body actually heal better and faster than others. No procedure can guarantee amy patients’ final healing result as the skin heals and remodels itself. » » to extract the follicles? » changes may occur along with unneccesary bleeding. » body actually heal better and faster than others. » heals and remodels itself. » » » to extract the follicles? » » changes may occur along with unneccesary bleeding. » » body actually heal better and faster than others. » » heals and remodels itself. Excellent. When we remove plugs, etc., we use sutures to promote a better aesthetic result. What is RHS WAY ? What do you guys charge for removing unwanted hair to be disposed? In strange places I might add! » » right eyebrow had less hair than the medial aspect of the left eyebrow. » » treated patient. Good luck to the patient. » strange places I might add! The cost varies depending on each different case. Call ahead and ask for Michelle, she will fit you on the schedule somewhere. Usually a test is accomplished to ensure satisfactory healing. It’s simple, fill this out and Dr. Cole will evaluate the case.